Wheat is one of the world’s most important food crops, along with rice (ranked first) and corn (ranked third). Thousands of products are produced from the grains of this grass. Wheat may be sold whole (as berries), flaked, cracked, puffed, and ground. Its most frequent use is in breads, followed by baked sweets and grains. Some alcohols are formulated with wheat while lesser-grade grasses are used for animal feed. Soft wheat – Best for sweets and batters that also include baking powder or soda. 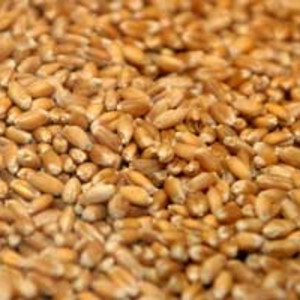 Hard wheat – Most used for bread doughs and other recipes that require eggs and yeast. Durum wheat – The base for pasta, which is called semolina. In Italy, semolina is recognized as a grain, not a flour. It is the “hardest” wheat and gluten-rich. White and red colors reference the shade of the outer hull (the bran). Kernel – Commonly known as the endosperm. This part is ground to produce white flours. The germ and bran are removed when the kernel is milled. Retains little nutritive value by comparison to the germ. Wheat germ – Called the embryo, this is the sprout from which the kernel emerges. It is oily and high in nutrients. Processed to make wheat germ oil and added to salad dressings and cooked dishes. Also sold as a supplement. Wheat germ is good for about one month and should be purchased as needed. Wheat bran – The protective outer layers that encase the kernel. Very high in fiber, but with less nutrients than the germ. Bran is sold as a fiber supplement that can be spooned over cottage cheese and yogurt. It is often included in muffins and other baked goods. Many cereals and granola products include bran as well. All-purpose – Used in an abundance of recipes (such as cornbread) and as a thickener. Unbleached – Preferred for yeast bread dough, but not as stable in many baked goods. Bread – Higher protein content that all-purpose flour.